You can experience God personally and powerfully! Jesus lives and does miracles today! We saw it in the Gospel of Mark and in the Acts of the Apostles. We hear testimonies of people who are touched and transformed miraculously. Join us for the last part of the series on the Gospel of Mark. Let faith arise in you so that you will experience God today! *Please note that there is no Saturday service on 27 April 2019. 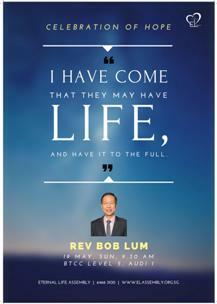 Pastor Bob is the Senior Pastopr of Eternal Life Assembly. 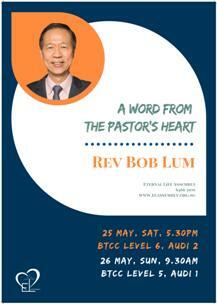 He grew up in the church for the past 51 years and assumed the senior pastor in 1992. He is married to Dorothy and has 3 daughters, 1 son-in-law and 2 grandchildren. The more we get together, the happier we'll be." This children song holds precious lessons for us because it is true. The more we get together, the better we are! God has not designed for us to be alone, to walk alone or to work alone. He makes us social beings who need one another. In the Christian community, we can it "fellowship" or "koinonia". We can meet together, eat together, have fun together. We can also work together, pray together, minister together. 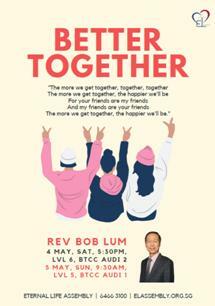 Join us for the services and experience the power of togetherness! 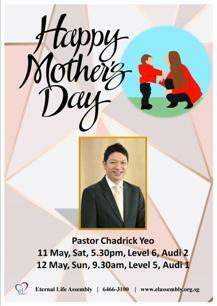 Every year our church honors mothers and women (in general) in our services. The Bible teaches us to respect and honor our parents. Mothers brought us into the world. They love us unconditionally and raise us up. Their love is often incomprehensibly peresevering and generous. They deserve our love and respect. Let's come together to celebrate Mothers and to give them the DUE RESPECT. Each mother will receive a handmade gift. We will pray for the mothers and women. Invite your mother and other ladies to join us for Mother's Day! Pastor Chadrick serves as the Discipleship Base Pastor in Eternal Life Assembly. He is a serious preacher of God's Word. Let his preaching enighten your understanding of God. Chadrick is married to Elaine and they have 3 young children - 2 boys and 1 girl. Every Christian is a testimony of the truth of this statement. We know Jesus as our Savior. Our sins are forgiven. We are reconciled with God and become His children. Today we live in the full confidence that God is with us. When our journey on earth ends, we will be with Him in heaven. This is a very special weekend for Singapore. It's the Celebration of Hope held at National Stadium Sports Hub. Join us at the National Stadium. To get tickets, please download the Celebration of Hope app on your IPhone or Android Phone. Pastor Bob accepted Jesus when he was 11 years old. He grew up in Eternal LIfe Assembly and has served the Lord actively. He left his job in 1985 and became the senior pastor in 1992. With the years of following Christ, let's come and listen to what he has to say. He is married to Dorothy and has 3 daughters, 1 son-in-law and 2 grandchildren.